This movie is a hoot. It's got such a gleeful mix of everything I hardly knew what to expect next - except, of course, that the family would be reunited, since it was clear from the get-go that there was heavy moral order going on here. You don't dump your kids off at the feet of Gandhi on Indian Independence Day if you're going to be noncommittal about how things wind up. 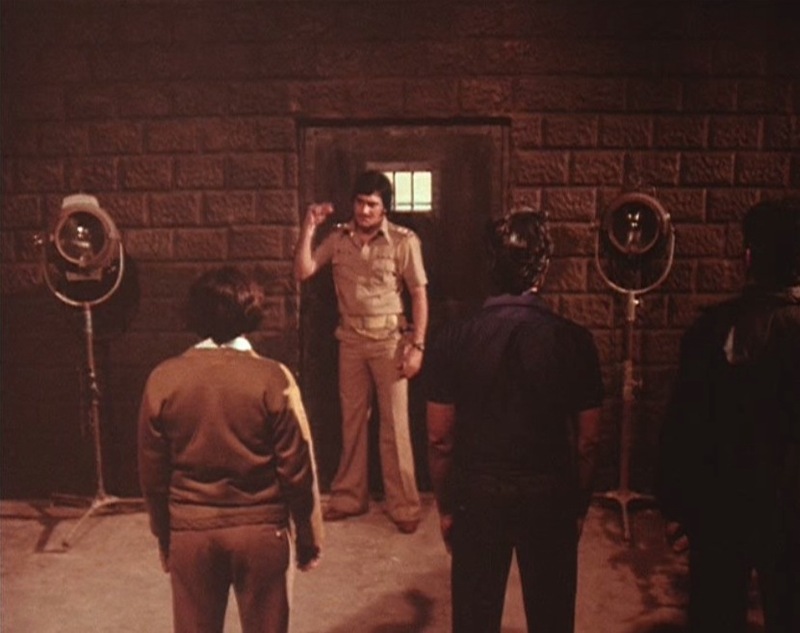 Vinod Khanna is so cool he can snap on the interrogation lights. This has got to be my favorite Amitabh fight scene ever. 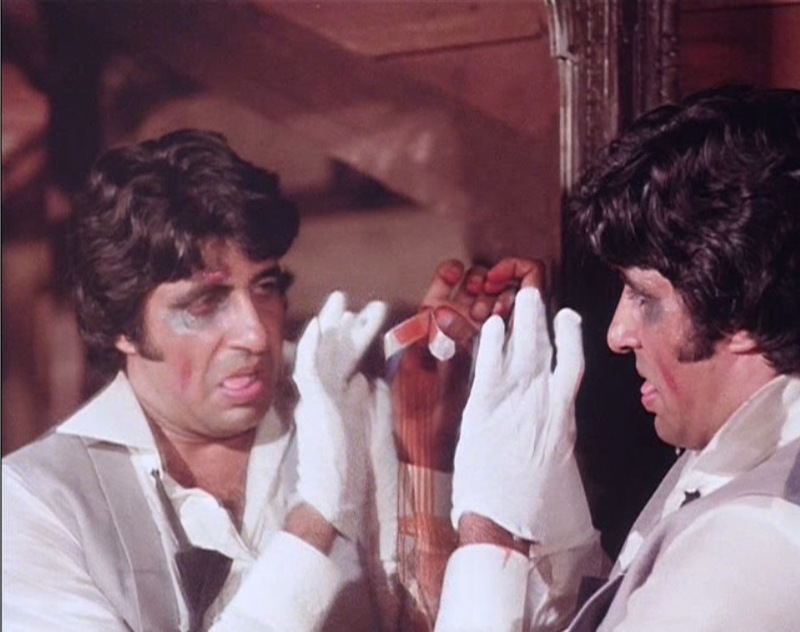 And this might just be my favorite Amitabh scene of any kind ever because he's so very, very funny. On second thought, wait. I do have something else to say - or, rather, ask. For reasons that are still not entirely clear, even after a solid 24 hours of thinking about them ("24 7 I think of you, 24 7 I think of you..."), there's an idea rattling around in my head that the people who made this movie had something serious, or at least important, to say, but I'm not sure what it is. There was something about the religious/cultural assignment of the three leads that didn't seem to be just for kicks - and I'm wondering if they're each supposed to represent some different facet of Indian culture, or the Indian experience, or maybe three distinct values. We have the oldest boy being Hindu, yet I don't think we ever see him do anything particularly religious (unless I missed it, which is entirely possible - he doesn't go to any temple, does he, or say a prayer, or make an offering...?). The Muslim and Christian sons, though, are more conspicuously religiously identified. (Speaking of which, what is that place Akbar is singing at when his mother comes upon him and, stumbling towards the statue, has her sight restored? Is it a mosque or a temple - or some kind of interdenominational communal house of worship? The statue seems to be treated like a Hindu deity of some kind, with garlands and coconuts, but didn't I see a star and crescent in that building too - plus, of course, Akbar singing? My dvd had no subtitles in songs, so I have no idea what he was actually singing.) (One aspect of the religious lens, or whatever you want to call it, that I found particularly interesting was the death of Anthony's "father" - who, celibate, has a "son" - who, for his flock's protection, gives his life. Kinda heavy-handed, but point taken.) Then we've got the whole nationalism thread, with the kids being left with Gandhi on 15 August and a blind but all-sacrificing, all-loving, all-welcoming mother named Bharati. 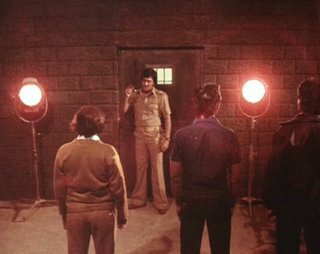 This movie was made 30 years after independence; are the filmmakers saying that India was stumbling and blind and only through the identification and embracing of its constituent parts can it regain vision? Anyway. My usual consultant on such matters is really busy right now, so I went on a research binge, as my librarian heart is wont to do. I haven't hit the academic databases yet - yet - but even I may not need to look any further, thanks to this great article on philip'sfil-ums. So think about the movie, then pop over to philip's and read what he has to say. Then get back to me, okay? I'm really curious about what everybody thinks. I love this movie, not least because of the cognitive dissonance I always experience in Shabana's masala turns. In partial answer to your questions: The temple where the boys' mother regains her sight is a shrine to to the Sai Baba of Shirdi, who actually has followers among both Muslims and Hindus, so this is indeed a very ecumenical and symbolic place, as you correctly noted. By the way, I know that it's a Sai Baba shrine because of the song Akbar performs there, "Shirdiwale Sai Baba." I also don't recall Amar doing anything specifically religious - really Anthony is the only one of the three who is religious in the sense we use the word (i.e. outwardly observant); Akbar is clearly a Muslim but he's most importantly a professional singer, an entertainer, a qawwal, which is part of why the Imam doesn't like him for his daughter at first. The song he sings in his first performance, "Pardah hai pardah," is not a religious song - it's a slightly bawdy qawwali in which he says "There is a pardah (a purdah, curtain), behind the pardah is a secret; if I don't uncover the secret, my name isn't Akbar." So he's talking about breaking through the symbol of female modesty - very risque (as far as the Imam and his daughter are concerned). Finally, in the wonderful tripartite love song, "Humko tumse," each of the three boys draws on the symbols of his own religion when swearing his love: for example, Anthony says "God promise," in English; Amar says "Ram qasam," and Akbar says "khuda gawah." Great movie! Totally fun and over the top, but with interesting stuff to think about too. Yeah, AAA was the biggest MKD (Manmohan Desai) film. And he made many big ones, so being the biggest of them all, means something. A typical Manmohan Desai film - wholesome entertainment. Something for everyone. Leave your brains at home, come, see and enjoy the 3 hours! Thats Manmohan Desai for you. They said about him, that after Raj Kapoor, he was the real entertainer or showman of the industry. He had his style, his panache. Its sad that he died with not a lot of money (perhaps debt, in fact) and his son had a hard time fending for himself, apparently..! That, after the many successes that he enjoyed. 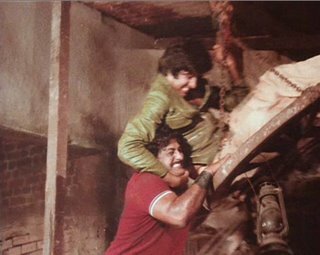 Coming back to AAA, it had all the masala that you can imagine in those days.. lost and found, hindu-muslim-issai, love-shmove, smugglers, action, comedy and some amazing performances. Amitabh was Amitabh, but even Vinod Khanna and Rishi Kapoor turned in star acts, not to speak of Pran and Jeevan..
Bollywood box office can be notoriously inaccurate but BoxOfficeIndia.com, which has a nice stake in the ground in this regard, tells us that if you adjust for inflation, AAA is 15th on the list of all time Bollywood box office hits. Even though it doesn't have somersaults by a cast of tens on top of a steam engine, an awesome supporting cast of inspectors and villians or even a coin with two of the same sides, AAA, more than Sholay, is the movie that appeals to people across genders and age. 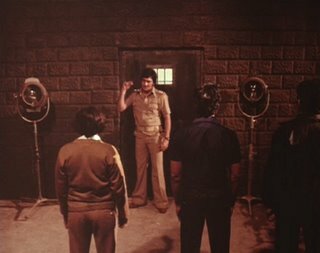 Now, if we can digitally remove Satyen Kappu from that movie, it'd be perfect. I am not sure whether MKD has this grand idea when he made the film. As rightly pointed out by SPM in his comments, MKD's films were wholesome entertainment. All religions co-existing was a strong idea that was uniformly accepted all over India (Not sure its the case now, though). The proof is all the remakes of AAA in other Indian languages were super hits as well. Oh, impressionist, something can be a well-crafted entertainer and still have interesting substance and subtexts. I'd even submit that the best entertainers work precisely because they have those interesting layers. No better way to grab an audience than by tapping into archetypes and other rich veins that run deep within its culture. I love AAA, especially My Name Is Anthony Gonsalves *g* and all the wacky 70s clothes ... That article on philip's fil-ums is really interesting, I didn't know about it before - thanks for the link! you know am sure Desai had no clue that his film would ever become the subject of intense discussions but some of the things that unconsciously get highlighted in the film are interesting. Like how the eldest brother has to be a Hindu and a polic official. One can see a clear linkage being drawn between religion,authority and well responsibility. The drunkard has to be Anthony...Akbar is an innocuous guy who is not intimidating in any way possible unlike the other two. The idea that religious diversities ultimately get accommodated within an essentially Hindu framework that makes up our nation is indeed difficult to ignore.